Something I’ve been bestowed with by this Philosophy class is the opportunity to speak and to listen. Unbeknownst to myself until this class, I have grown up through the education system with an abundance of privilege looming over me. I am a decently academic, straight, white, male, in a fairly financially stable position. Prior to arriving in Philosophy 12, I had been in classes which I had my hand up more often than it was down, and spoke excessively when I thought I had a decent point. In my mind, I was always right and I never gave others opinions much thought or the chance to be simply an alternate perspective. I spent a long time thinking about Plato’s Cave, and from many different aspects. I could say that I have turned a new leaf in my life, and now have learned to appreciate nature to the fullest. I won’t. I could say that, because of my suffusing independence, I have broken free from my shackles and now take the reins, leading the path I want to. I won’t. I could say that I’ve finally understood what it means to be human, vulnerable, and have flawed belief and intellect. I won’t. Why? I don’t want to say something that’s not true to me, no matter how wonderful the words may look on the page. That would only tighten my shackles. Currently, I am staring blank-faced at the shadows being portrayed in front of me. They’re vivid, and the mindless zombies beside me agree on that. I have many friends that come visit as well, and share great tales of the land “outside.” I listen, and out of the corner of my eye I can see the light leading up the stairs and away. These shadows are fake. I know that. The problem is that I’m too scared to take those steps, and the shadows are too comfortable, real or not. I purposefully remain indolent and seemingly oblivious to the truth that is mere paces away. To be honest, I can’t take more than a step towards the light without losing all self-control and lamenting over the futility of being alive on Earth. I, along with many others, pretending to ignore the hollowness in my chest and to distract myself with any activity possible to avoid passive thought. One thing that I’ve never been able to do was find incentive or self-determination to complete my work. Maybe this is a step closer to the exit, maybe it’s not, or maybe I’ll trip and stumble back to where I sat shackled. “Human, All Too Human” is a three-hour BBC series from 1999, about the lives and work of Friedrich Nietzsche, Martin Heidegger, and Jean-Paul Sartre.The filmmakers focus heavily on politics and historical context — the Heidegger hour, for example, focuses almost exclusively on his troubling relationship with Nazism. Reality is what you think it is; there is no other explanation for reality. For you it can be what the majority of people think is the ‘real’ thing, or something that can prove itself through reasons and logic. Or you might just think there is no such thing as reality. I would rather not to make it too complicated for myself. As an example, in order for me to accept something is real I should be able to see it and feel it. If I see something like a physical object, the only way I can confirm that it exist is that I should be able to see it and feel it by myself. But what about more complicated things like what I see on TV? Well I most likely rely on other people’s experience and knowledge in order to understand if what I’m seeing is real or not. Like on YouTube I always read the comment to know other people’s opinion and thoughts about the video; a lot of time there are people that have more experience about the video than me and they can tell if it’s real or not. So you can say that real things to me are the thing that other people think is real too. Again reality is what we THINK the reality is. There hasn’t been a single idea or theory that is acceptable by everyone. There is always a way to deny things; sometimes it’s easy and sometimes it’s hard but it’s never something impossible. It’s all connected to the understanding of the knowledge that we have. Think of reality as the universe, now imagine you want to understand it: you can’t because we have not achieved that level understanding of things in such scale, so what we did as humans is that we create ourselves an vague answer. We said that universe equals to infinity, but you see how easy it is for us to deny it. Did you know that infinity is a scale that can be counted? I will explain in an example how you can count infinity. Hilbert’s paradox of the Grand Hotel is an is thought experiment which illustrates a counterintuitive property of infinite sets. It is demonstrated that a fully occupied hotel with infinitely many rooms may still accommodate additional guests, even infinitely many of them, and that this process may be repeated infinitely often. What is Philosophy? To me, philosophy is just like makeup. 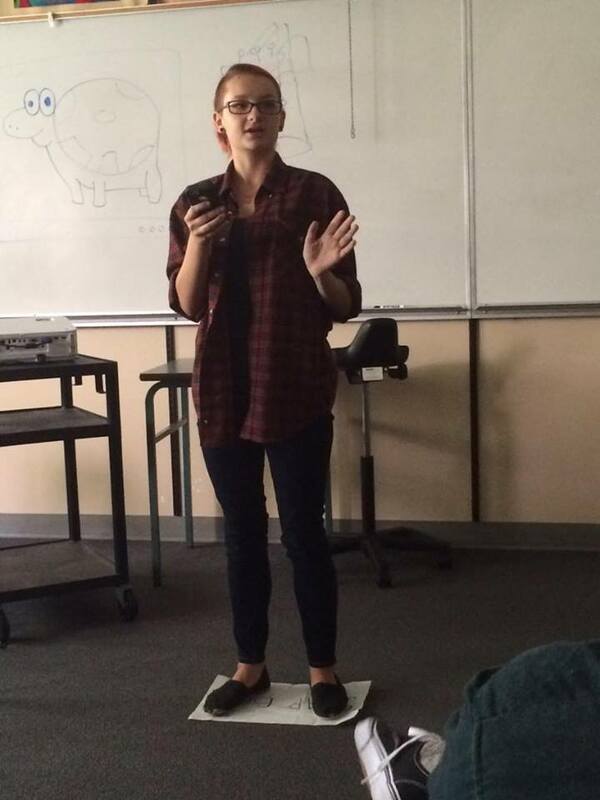 I understand that my presentation in class was super short and brief, but let me further explain!! Makeup is a passion of mine because it allows me express myself through an art form. Makeup has no set rules therefore allowing you to do what you want! Also, there is no “incorrect” way to do makeup, so there’s no one telling you what or what not to do! I believe that philosophy is makeup because just like makeup artists, philosophers express their thoughts, feelings and ideas to an audience or a group of people. A face with no makeup on is considered the “philosopher” and each makeup product is an “idea” or a “theory”. In relation to the allegory of plato’s cave, when I was young and makeup-less I was in a cave. Everyone around me always telling me that what I was doing was always the wrong way to do things; my teachers, my dad…etc. But then, I got released from the cave and found an art that allows me to express myself in a way that’s is ALWAYS right. 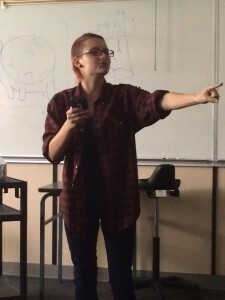 So, I’m goingto be real here: I dont remember if the “What is Philosphy?” presentation was a part of the intro to philosophy or the logic unit… so im going to tag it as both and hope for the best. I don’t really want to pist my script here, as it is a lot of me yelling REPENT!! and waving my hands about. Basically, I found my original medium in the for of a soapbox preacher screaming on a streetcorner. 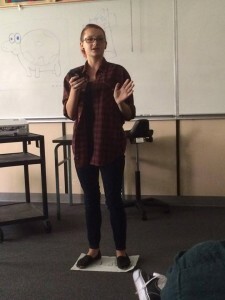 Now, my soapbox was a piece of paper where I had written soapbox, but it worked. My metaphor? Philosophy….. is like….. a river. Or water, to be more general. But that’s the gist. All in all, this project taught me I’m a lot better at talking in front of people if I’m yelling dramatic nonsense at them. you get salvation! you get salvation! EVERYBODY GETS SALVATION! What is philosophy? The word translates to “loving wisdom” but to illustrate what philosophy is beyond its words, I use fishing as an analogy to show some of the key attributes of philosophy. 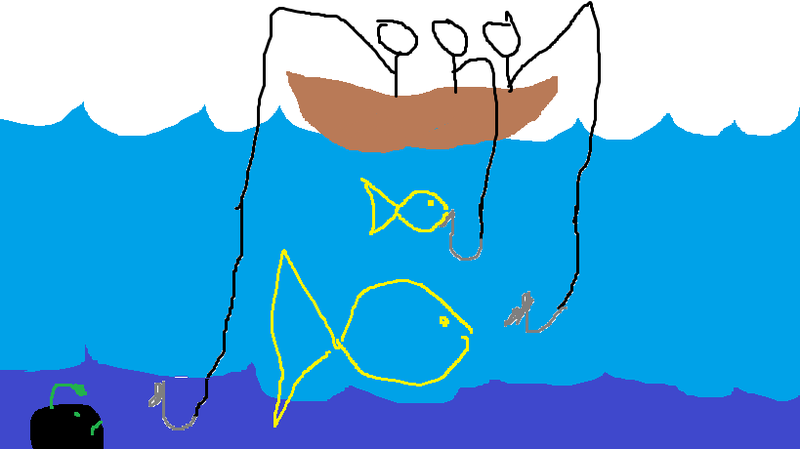 Imagine, sitting in a little boat with our fishing lines cast into the water, to hopefully catch some fish. I believe philosophy is a constant search for explanations; looking for possible answers to the ‘how’ and ‘why’ questions that we create, in order to ultimately reach ‘truth’… even if we can never know what that ‘truth’ is. Coming back to my analogy, there is the fishing rod, which are the questions we ponder about. Its length represents the complexity of its questions; the hardest questions to answer, become the longest rods, reaching into the deepest parts of the ocean. Going with the rod, is the bait. The infinite combination of different materials as bait represents the infinite amount of questions one pose. Some bait are naturally successful at attracting fish, while some catch nothing but irrelevant, useless information (like catching a boot). Although the rod and bait sound very similar, the rod determines the ‘depth’ of the questions, while bait represents the questions themselves. The fish represent the knowledge or explanations to these questions. As we catch more fish, we are able to cast our line deeper, finding even larger fish. Now there is more than one place to go fish. There are ponds, lakes, rivers, and of course oceans. Humans fully know what types of fish swim through different rivers and lakes. It is not hard to see the bottom, and with a bit of time, it is not long before they find all the different fish at that river/lake. Next they do is to record what was found in that body of water, and move on to the next lake and river. Eventually all the lakes and rivers have been explored, every fish caught. Humans eventually create a collection of this ‘fish’ knowledge, for everyone else. For many this is good enough; they can use this information to find food, make money, and live their lives out. But for some, they need to know more. and they are attracted into the deep deep ocean. The ocean is different; here we have no clue what is at the bottom. We have absolutely no idea what type of bait to use, or if there is fish down there at all. All the different baits, and rods, and techniques that one knows about, have no guarantee it will do any good. All they know is that the ‘big fish’ at the bottom will reveal everything about the world, and their mission is to reel it in. This is the job of the philosopher; to sit on his boat, and wait for something to tug. But waiting becomes too boring to handle, so the philosophers who are waiting, sit together and have some legendary discussions in their little boat, about what that ‘big fish’ could be, what it could look like, or if its there at all. Every once in a while the line tugs, and they try to interpret what it means, but in the end they all wait, and ponder. And everyone knows the best fisherman are those with the most patience. I remember as a young child my dad always took my sister and me fishing. 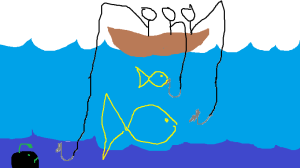 We would sit in our little sailboat for hours, waiting for just a single fish to tug. Philosophy and fishing are alike in the sense that they both reward patience. Of course I was so fascinated by the ocean, and all the possible fish I could catch. However, I could never wait long enough. I remember I would take any slight nudge on my fishing rod as an excuse to reel it back in, and of course I never caught any fish. My dad on the other hand was the exact opposite. Hours at a time, he would sit and tell us stories from his life. And then all of a sudden he would reel in fish that were bigger than me. The first two weeks of philosophy has been quite interesting. This class is unique from any other class in how it is run, and it is an refreshing change from the “teacher gives notes and student studies them” approach. So far we have looked into several topics, including the purpose of education, what it means to love wisdom, and the importance of conversation in philosophy. These topics have generated more questions than answers, which is a little frustrating, but it has made me understand that philosophy does not always have an ‘answer key’ hidden somewhere, and many questions will never have just one right answer. The article “Talk with me” discusses about how philosophy isn’t about finding answers in solitude, only collecting what yourself knows. Instead, it discusses how important it is to discuss and share viewpoints with others. I found myself agreeing to pretty much the entire article. One line that stuck with me was “philosophy is a subject that weighs positions, not just airs them.” I think this is very important because it changes the discussion from simply sharing opinions, to critiquing and challenging perspectives. This pushes myself and others to improve their arguments, in a search to find how “things really are”. We also spent some time discussing what philosophy (‘to love wisdom’) really meant. Many of us have a pretty clear handle on what is love. It is not only an primal attraction, but a dedication and care for something (or someone). Wisdom however, was harder to define. I believe wisdom, is experience, something that cannot be found in books or online. I believe wisdom is Knowledge may be about learning facts, but I believe learning how to apply knowledge to the real world is wisdom. This leads into some of my goals for this course. My first goal is to partake in interesting, thought-provoking discussions/debates with my peers. I want to avoid the ‘my opinion vs yours’ type conversations and be able to critique others’ arguments as well as take in criticism, to further my understanding about these large philosophical ideas. I hope these conversations will lead into another goal of mine, which is to form my own philosophical opinions about different topics, based on my own set of values and morals. Without being knowledgeable, it is impossible for me to establish my own views on topics. Through some of the knowledge I gain from the course, I hope to gain a better understanding of where I stand on certain issues, especially around the topics that intrigue me most, which are logic and ethics. Seventeen years, only a mere fraction within the history of humanity and the universe itself. This number (our age) defines all that we’ve seen, questioned, experienced and deciphered in our entire existence. Isn’t that somewhat daunting? That all the information and people we’ve known has been limited to a value defined by our age? I would argue that acquiring or dismissing knowledge is a direct consequence of ignorance; where the absence of curiosity can dictate, to some extent, the subduing effects of our own free will and creative thought. While some are comfortable to live in ignorance (although they may not know it), others are more inclined to give in to that nagging feeling of wanting to know more; to know if there is more to know. I for one think that it’s not really a “duty” for people to acquire knowledge for they might live a happy life, however I perceive it as the nature of our humanity and a part of our everyday lives. To simply know more of our copious world can be seen as a learning process and for some a necessity. As Warren Buffett once said “The more you learn, the more you earn.” However, as some crave the desire to expose themselves to new realities, some are not willing to “escape their cave” which brings me to my next point. As seen in the allegory of Plato’s Cave, three chained prisoners are born with a limited capacity to perceive and understand only what they can see in front of them; projected shadows of “reality” itself. They do not know that what they perceive is limited to the physical realms of the cave until one of them is freed and ventures off into this true depiction of reality. 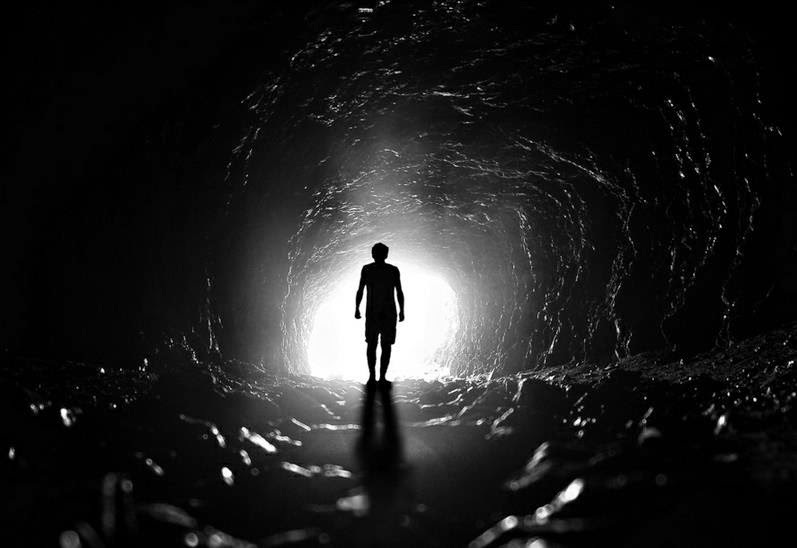 Upon returning to the cave the freed prisoner feels that his journey out to “reality” may have actually harmed the freed prisoner since the shadows in the cave no longer appeared with clarity. These shadows the prisoner could not make out are almost like the people who go through some form of enlightenment that shifts the paradigm in which they live in. These ‘unclear’ shadows represent your previous paradigm; one that you are not able to see clearly anymore (and not necessarily agree with) but is still present in your mind. Let’s say you are exposed to an enlightening reality that challenges everything you’ve known about reality. Whether this arises from a conversation with your friend, a movie you watched, a talk you went to, until you feel exposed to an extensively new reality are you able to escape your own version of ‘Plato’s Cave’. I tend to think that we’re always in a cave. We are essentially encapsulated in a series of caves where we uncover them through gaining knowledge, questioning, and experiencing a new reality. In other words, being exposed to “enlightening” situations in your life. Whether you are a person who chooses to cultivate knowledge or simply dismiss it, we are all still very ignorant people in one way or another. Just stop think and think to yourself, you will find that in certain situations in life you might be the chained prisoner witnessing the returning man’s blindness, when in other cases you may be the returning ‘blind man’.